Description : 3 Single LED light with 4 color lenses. Super bright outdoor LED lights. Can be used in the garden, around the pond or submerged underwater. The long cable allows you to set it where you want…. 3 Single LED light with 4 color lenses. Super bright outdoor LED lights. Can be used in the garden, around the pond or submerged underwater. The long cable allows you to set it where you want. The unit has an adjustable bracket allowing you to tilt the light at different angles. 4-colored lenses allow you to create different effects. 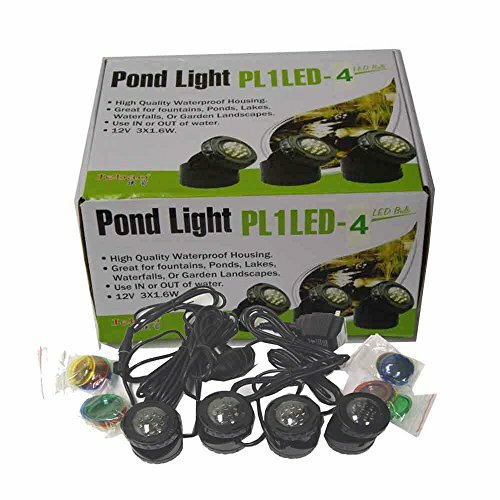 The light can be used underwater or in your garden. 2. Red, blue, green and yellow colored lenses. 3. Swivel unit so can be angled to suit your needs.